Senator and Presidential Candidate Bernie Sanders attending a Fox News Sponsored Town Hall on April 15, 2019. 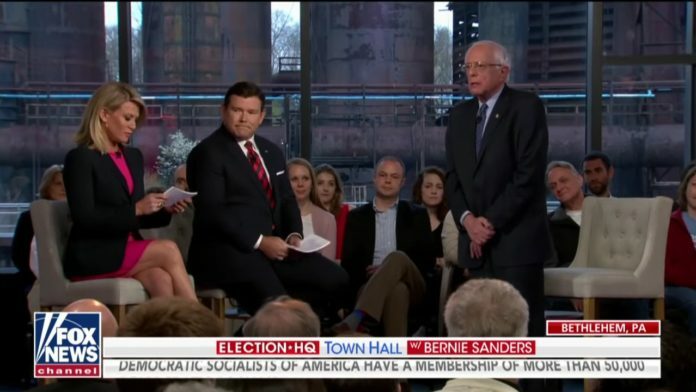 Congratulations to Senator Bernie Sanders for breaking out of the Echo Chamber and having a town hall on Fox News. While Fox News has deplorable individuals among its commentator ranks like Jeanine Pirro, Laura Ingraham, Sean Hannity, and Tucker Carlson, it is important that Democrats and Progressives continue to reach out to most news outlets to convince all voters that it is their ideas that will steer the country forward in the right direction. Some evidence of this showed last night when most of the attendees at the town hall expressed support for Senator Sanders version of Medicare for All. Overnight ratings showed a tremendous interest in the event with over two and a half million people watching on television. It has also apparently worried the 2016 Popular Vote Loser who tweeted some apprehension the morning after the event where Sanders called him (the KKK endorsed candidate) “a pathological liar” who even lies about where his father is born. It is vital that the Democrats, in order to expand their numbers in the House and recapture the Senate and Presidency, continue to reach out to voters that they lost or decided to stay at home in 2016. Attending events on Fox News as well as CNN, MSNBC, and other mainstream media outlets provide an opportunity for all Democratic candidates to reach out beyond the choir in the echo chamber to those who thought Donald Trump would bring needed change and convince them that they (the Democrats) have the better vision, message, and strategy for the people and the country. 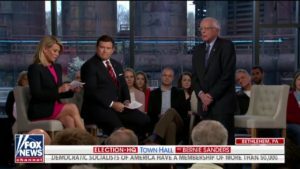 The Democratic Party, while recognizing that several commentators on Fox News are repulsive and hostile to what Progressives stand for, need to rethink their decision to boycott any Fox hosted candidate debates. The Party, Presidential Candidates, and Country will be better if they did.